Looking south, toward Cowles Mountain, from within Mission Trails Regional Park. 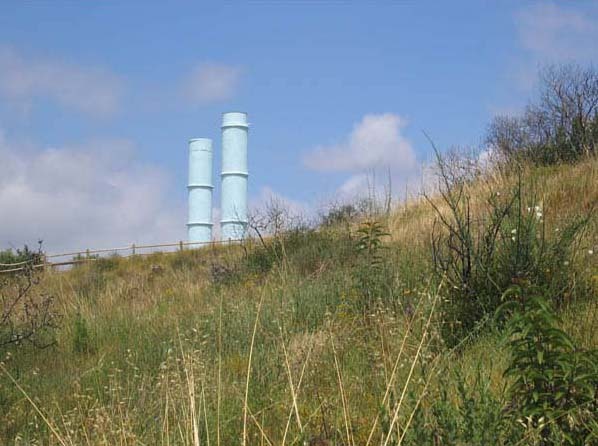 All blue vent stacks, seen in the distance, have since been removed as part of the Mission Trails Project. 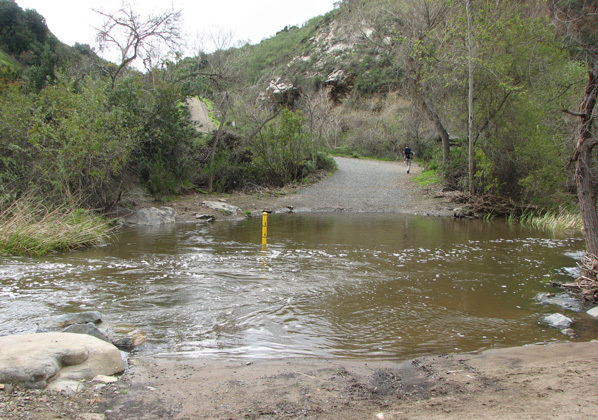 Design of a new underground flow regulatory structure in Mission Trails Regional Park has resumed. 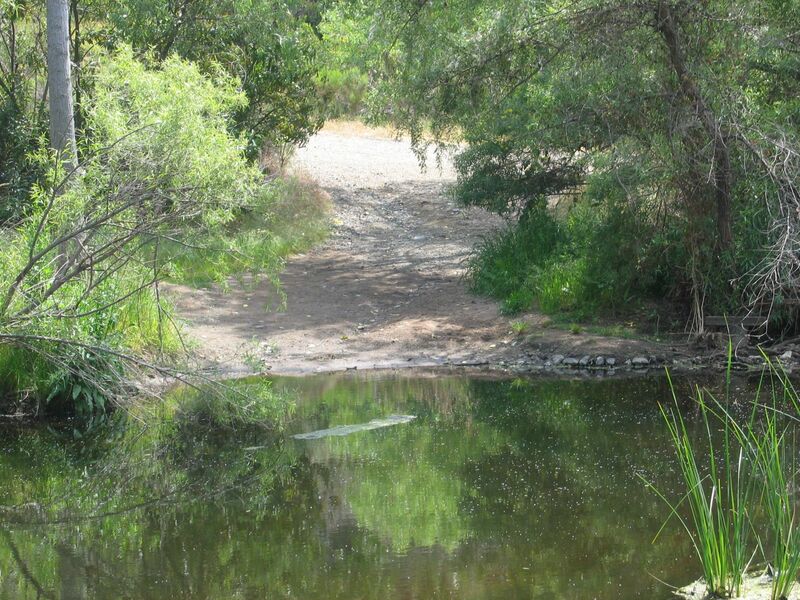 The new facility was part of a suite of projects called the Mission Trails Project that were to be constructed in the western portion of the park. The projects included the new FRS II facility, a new pipeline tunnel, removal of existing blue vent stacks, and a new Arizona crossing of the San Diego River. Everything except the FRS II facility were constructed by late 2010. FRS II construction was delayed by the Water Authority’s Board of Directors in early 2011, who cited increasing water rates due to lowered short-term water demand forecasts as reasons for delaying the project. 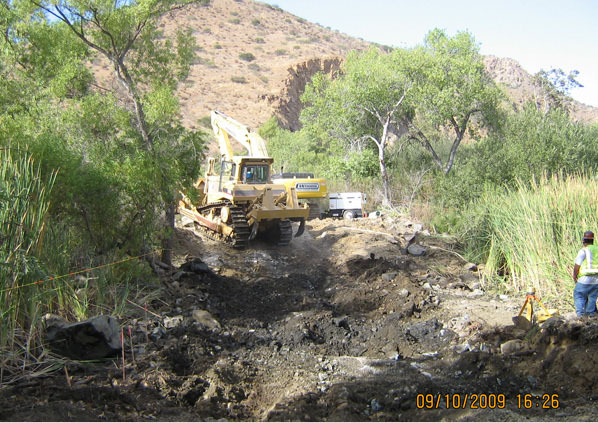 While this webpage contains details about previously constructed portions of the Mission Trails Project, more information about the FRS II project can be found here. 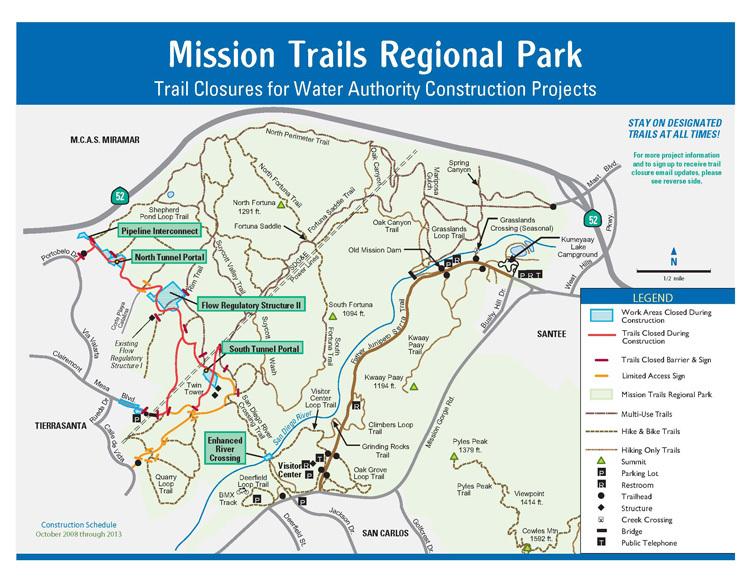 The San Diego County Water Authority maintains critical water pipelines beneath portions of Mission Trails Regional Park in the city of San Diego. The Water Authority is upgrading its untreated water system in the northwest area of Mission Trails to deliver more water to treatment plants that serve the central and south sections of San Diego County. Construction of a new underground flow regulatory structure. Two existing small pipelines were replaced with one larger pipeline. Nearly one mile long, the new pipeline was constructed in a tunnel and will be able to deliver larger quantities of untreated water, when the new FRS II is complete. A majority of work on the tunnel and new pipeline took place underground in Mission Trails Regional Park, just east of the community of Tierrasanta in the city of San Diego. The pipeline will connect to the new FRS II after it is constructed. A new underground flow regulatory structure, or covered reservoir, will be constructed to help regulate the water system’s flow of untreated water. It will be capable of holding up to 5 million gallons of untreated water. 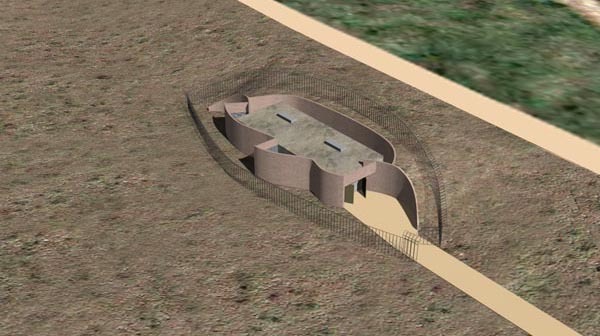 The facility will be covered with soil and vegetation, with the exception of access hatches and above-ground vents to allow for air movement in and out of the reservoir. Construction is anticipated to begin in early 2020 and last approximately 18 months. 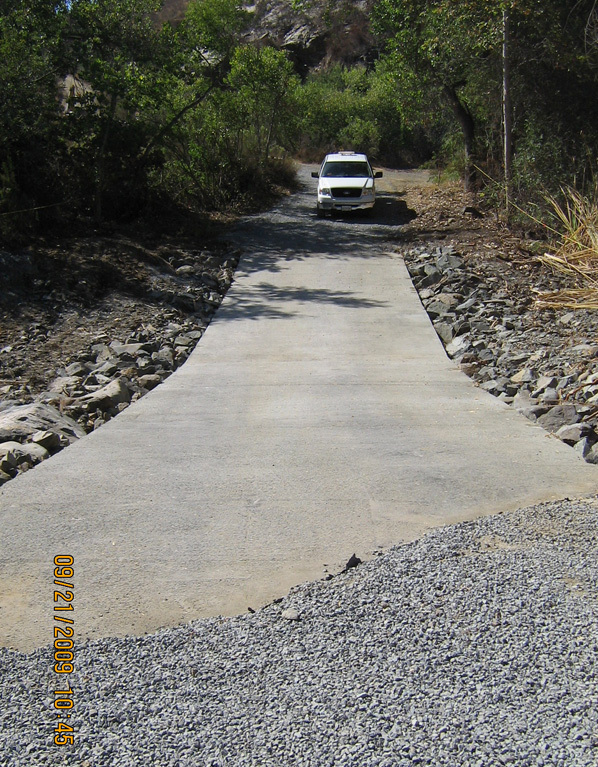 A river crossing that allows Water Authority, park ranger, fire, police, and emergency vehicles access to Mission Trails Regional Park was improved as part of this project in September 2009. Concrete slabs with footings, as well as a bollard marking water depth, were added to facilitate crossing for small trucks during low and normal water flows. The new, improved crossing will allow rangers and authorized personnel better access to the park. Pictures of the improved river crossing are included in the Multimedia section, below. Vent Removal - Elliot vents sit on a hillside in MTRP. When the new flow regulator structure is constructed, the Water Authority will be able to remove the remaining vent stacks in the park and replace them with smaller structures. 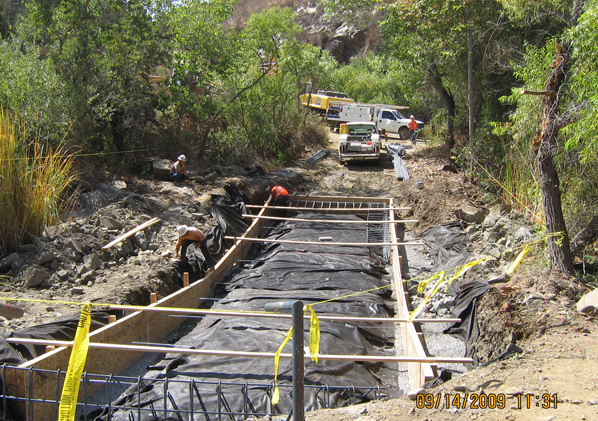 During construction of the pipeline and tunnel portion of the project, Tierrasanta area roads experienced an increase in the number of large construction trucks. The truck activity is expected to be similar when construction of the new flow regulatory structure begins in early 2020. Construction requires large trucks to travel near certain Tierrasanta schools to access the western part of the park. The major roads that will be used include Clairemont Mesa Boulevard, Santo Road, Via Valarta, Antigua Boulevard, and Portobelo Drive. Truck drivers will be required to follow appropriate traffic rules, as well as weight and speed limits. Safety is the Water Authority’s first priority, and we want to help keep kids safe. During construction, please talk to your child about street safety. 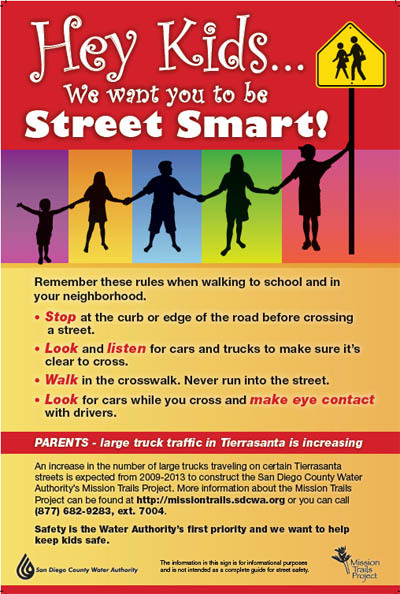 “Street Smart” posters providing street safety tips will be provided to schools near the access routes. Please look for these posters at your local Tierrasanta school. When construction of the new flow regulatory structure begins in early 2020, trail safety will continue to be, as it was during the pipeline tunnel project, an important aspect of the project. Also important is maintaining recreational access to trails at the park during construction, whenever possible. To keep trail users safe when construction resumes, certain trails in the western portion of the park will be closed. During construction hours from Monday through Friday, 7 a.m. to 7 p.m., closed trails will be off-limits to recreational access. However, trails will be accessible outside of these construction hours and on Saturdays and Sundays. Any closed trails will be reopened after construction completion. *All dates are approximate and subject to change. Trail closure map for pipeline tunnel project. A new map will be created for the FRS II project in advance of construction. The river crossing site prior to installation. A bulldozer prepares the river bottom for the concrete pad. Preparing the river crossing site for rebar installation. The finished concrete pad for river crossing. The new river crossing, shown under water. There are no videos for this project. There is no additional Multimedia for this project. From May 2005 to March 2006, the Water Authority convened a public working group to gather community input about the project. Working group members included representatives from the Tierrasanta and San Carlos communities, Mission Trails Regional Park, and park user groups. The group met periodically throughout the design, environmental and planning stages, informing the Water Authority of their concerns and providing suggestions for addressing those concerns. Click here to view the Environmental Impact Report and other environmental documents for this project. For more information, please call the 24-hour toll-free project information line at (877) 682-9283, ext. 7004 or email CIPinfo@sdcwa.org. A representative from the project team will return your inquiry within one business day.